Many customers use the Nextion display in their own business projects. They may need to upload the Nextion firmware through their own MCU. Here we disclose additional considerations to the Upload Protocol beginning with Nextion Editor v0.53 and later. Both Address Mode and Protocol Reparse are advanced techniques and should not be used if not fully understood. However, additional considerations are needed in the Upload Protocol should either of these advanced techniques be used. In order to set up a serial connection between Nextion and your MCU, you will first have to find which serial port their Nextion is connected to, and figure out the connection parameters. Nextion operates at TTL N81, so primarily you are looking for which serial port, and the Nextion’s operating baud rate. The first line will cause Nextion to exit active Protocol Reparse and return to passive mode. The second line is the traditional connect instruction. The third line is the connect instruction using the broadcast address of 65535. In this combination, the Nextion will be able to respond with its connect string regardless of which mode it may have been in. 1) Conflict resolution with other serial equipment is beyond the scope of describing the protocol. It is better to create a connection directly using the Nextion’s known parameters than it is to poll in hopes of finding. 2) It is strongly recommended to send an empty instruction (ie: ÿÿÿ) before the connect instruction. This desired result is gained using the above. 3) Recommended delay to be used between connect attempts is calculated and not random: (1000000/baud rate)+30ms. Step 2. Nextion’s current configuration and address. Nextion will return a connect string when the right serial port and connection parameters are used. For example, NX4024T032_011R will return below 8 group’s datas. The data is separated by comma. comok: the handshaking protocol is setup. At this point, Protocol Reparse is in passive, but Address Mode may need handling. If Nextion address is 0, then the remainder of the instructions can be sent as normal. But if Nextion is in Address mode where the address is other than 0, then the remainder of the instructions will need to be sent with the two byte address prefixed to each instruction. In the above example connect string, the Nextion address is 2556, or hex 0x09FC. This would require the remaining instructions to be sent prefixed with the two bytes 0xFC 0x09. The remainder of this document will be presented as if address was 0 and not requiring two byte address prefixing. It is best to handle any necessary steps needed to counter sleep functions or low dim at this this point. If your HMI project does not make use of low dim or sleep functions, you can skip this step and proceed to Step 4. Using the get instruction, query the necessary system variables for your sleep functions and dim setting used and conditionally adjust them as desired to avoid any potential conflicts with the upload process. As these are user project dependent and all simple instructions from the Nextion Instruction Set, there is no need to cover in depth here. Now that the serial port and current baud rate is known – send the upload command. The Nextion device will send a 0x05 byte within 500ms after receiving the whmi-wri instruction notifying that it is ready to begin receiving the .tft file contents. Users must wait until this 0x05 byte is received before sending or risk that the data sent before Nextion was ready will be deemed lost (and therefore a corrupted and unusable upload). Users must split the .tft file contents into 4096 byte sized packets with the final partial packet size equal to the last remaining bytes (<4096 bytes). Users then sends out each packet, and in turn wait for the Nextion to return its 0x05 byte confirming reception and readiness to receive the next pack. Once the final partial packet has been sent and the confirmation 0x05 has been received, the upload portion is complete. After the firmware is complete, Nextion will reset and make any necessary firmware adjustments internal to the Nextion device. It is important to wait for these procedures to complete, they are not instant, nor is their time to complete foreknown. As per the Nextion Instruction Set, Nextion will send an 0x88 Return Data notification indicating it is now ready. It is wise to wait for such notification before proceeding with your normal upgraded HMI processing. 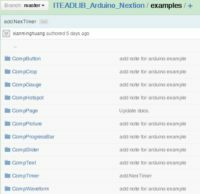 To make your own upload code, refer to the NexUpload in the Arduino library as an example.